Today I was filming a game design video about Stratego, and as I waxed poetic about how good this ancient game is, I realized: Some of the games from my childhood were really, really good. So I decided to put together a list of those games, ranked as a top 10. I’m pretty sure this is comprehensive, but I may have missed something. I’m 37, so I’m viewing my childhood as years 1-15. 10. Monopoly: Okay, yes, now I realize that Monopoly isn’t the finest game design. But we had a lot of fun with it! The thing about Monopoly that some people may overlook is that it’s a rare game where some of the best things happen when it’s not your turn (but are the results of previous decisions you made), keeping you engaged throughout. 9. 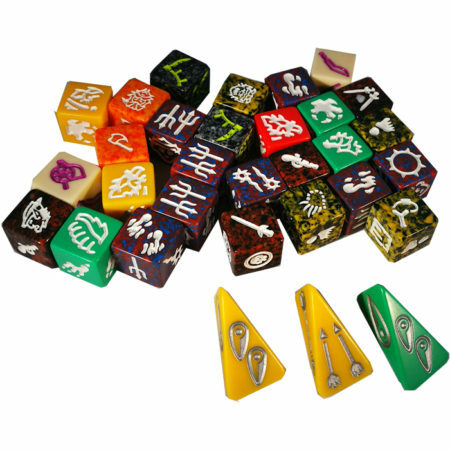 Dragon Dice: In an era when components really weren’t all that great, Dragon Dice was the polar opposite. Even by today’s standards, the dice in this game were beautiful. They’re a joy to roll. I love the idea of building your faction–each one feels a little different. 8. Chess: I remember playing a lot of chess when I was 9, 10, 11 years old, thinking I was pretty good at it. Then I went to summer camp and played against someone who actually was really good at it. I still had a lot of fun playing chess, though. 7. Mille Borne: We played this French card game as a family all the time. It’s simple, but it still features quite a few interesting decisions. 6. Key to the Kingdom: This game was magical. I don’t think I’ve felt as transported to another place as when I played Key to the Kingdom. 5. Labyrinth: Labyrinth is such an elegant game. You’re trying to create a path out of a maze, and you do this by sliding tiles into the maze, altering the paths for you and your opponents. I really need to play this again as an adult to see if it’s as good as I remember. 4. Risk: I discovered Risk in my teens, and we played it quite often. My favorite part was the initial setup when anything seemed possible. 3: Magic: I played Magic casually–and mostly multiplayer, which seems weird in hindsight–for a few years in my early teens. I had very little concept of what made a good card or deck, but we still had a lot of fun with it. 2: Stratego: I had a good win streak of Stratego that lasted many years. I love how clever and mischievous you feel in this game, especially during setup. 1. Scotland Yard: This hidden-movement game is at the top of the list because when I brought it home from Christmas a few years ago, it jumped onto my all-time favorite games list and has stayed there ever since. It’s simply a blast to play. What are some of your favorite childhood games? Do any of them still hold up? This entry was posted on Tuesday, March 13th, 2018 at 9:49 pm	and is filed under favorites and tagged with board game, favorites. You can follow any responses to this entry through the RSS 2.0 feed. My brothers and I always loved Hotels – basically a cooler looking Monopoly. Still enjoy playing that one! I second your choice of Scotland Yard. I actually can’t wait to teach it to my young son with my original copy from the 80s. It’s in a stack with other classics that can’t easily be spined like all my modern stuff. Ditto for Mille Bornes and Labyrinth. I think the other great family game was Clue as it offered something that wasn’t foreign to family or friends who were used to “roll and move” stuff, but it was more rewarding in my eyes. Solving a murder by investigating and deducing. I also had to develop a special code/shorthand in order to document all the bits of info on those tiny slips of paper. My favorites were Risk but before that it was Ratrace, Life which Grandma had, Stratego, and Clue. OMG. I need to go find my Dragon Dice. My favorite game as a kid was playing “Life”, especially with my sister. No need to use past tense with Dragon Dice. SFR continues to produce the game to this day. It’s kept me captivated for 22 years! Mille Borne is another great one on your list. I have a few very old copies of it. The reimplementation “Grass” is great fun. That’s great to hear, Joshua! I’ve never heard of Grass–I’ll have to check that out.